Yes my third cousins Great Grandfather Rupert Lochinvar Sheldon kept a team of Grey Racing Camels there but unfortunately wasn't very successful and one night there was a terriffic Thunderstorm, the Camels got out, Stampeded and they all drowned in Babbs Mill pool. Rupert was distraught, all he could do after that was play Chess against himself. Unfortunately he couldn't even win that so he chucked his King up in the air when he looked up the King dropped in his mouth and he choked to death. His wife Esmerelda was blamed for killing him and was burned at the stake. Their two Children Gwinron And Percival Charles were named as accomplices and thrown in the Tower of London. They were murdered by two princes that were already being held there. The rest is history. 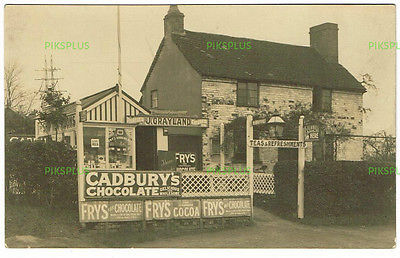 This must be the ship tea rooms as the picture shows a ships mast and the name on the board is J Grayland. That's all there is Lyn. I stole it off the internet. I'll check the book "Around Sheldon" to see if there is one in there. This is the Kelly's 1936 entry for Graylands Ship cafe. By this time is isn't the first address after Lyndon road. A photo of the Sheldona Cafe. It's interesting that the book says the photo is from 1921 and the cafe is near the Wheatsheaf Hotel. This is very unlikely considering the Ship cafe is near the hotel, the buildings are not the same and an identical postcard for sale on ebay is stamped 1904. Also odd is the lighthouse on the roof. The Ship has a ship with masts, perhaps there is some copying of ideas going on. Here's a better one, you can read the strange writing on the wall.